Just a quick fun thing. I’ve been playing a lot of Dawngate lately, and squeezed in a drawing of one of my favorite characters to play last week. Meet Zeri. 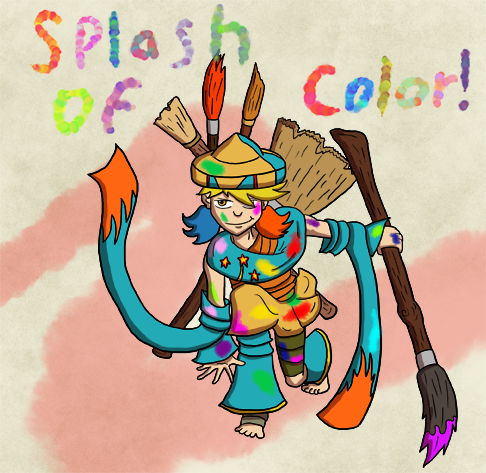 “Splash of color!” is one of the things she yells as the throws globs of paint on people. I hold my stylus the same awkward and uncomfortable way I held a pencil when I was a kid to create Selkie's handwriting. It's... not much of an improvement on my adult handwriting, to be honest. I like her attitude towards her essay assignment, and I hope she gets some leeway for how little time she had to do it. Hee, I like how this page echos Trunchypoo’s a few weeks ago. I also like the difference in it. Trunchbull said “My Thomas /should/ be learning math”. Where Todd said “Selkie loves science stuff and missed so many things she loves”. Granted, not many enjoy math, but the stark difference in what they care about. Todd is worried about how Selkie missed things she loved. Trunchbull was worried about what Truck “should” be doing. Parallel, but different. It’s really cool. *clap clap* well done Dave! Oh! Of course! No ulterior move, never ever. Cause Todd would Never think those things. But I think Mina would offer up a less private space, like the public library. In my experience not many authors let their fans decide what happens with the characters. He’s more likely to pull a George RR Martin and kill off the fan favorites first. Well, if Dave were like that, yes. But doesn’t it depend on the Comic-er more than anything? I Don’t believe Dave would change what is happening (or going to happen) any more than Tom Siddell would, not for the fans. I think Dave gets his kicks reading the comments as much as we get ours from the comic. But I don’t think he’d change the story he’s telling for our whims. Sometimes, not often but sometimes, I may hear people wanting to see something happen and see if I can figure a way to squeeze it in if it was something I was on the fence about including anyway. This is an example of that. I WAS going to cut away after Todd and Mina finished talking, but people were mentioning wanting to see Todd have a “talk” with the Principal directly, and I had some dialogue I trimmed out earlier that I hadn’t really wanted to let go. Figured if people want to see it happen anyway, I can probably convince myself to squeeze it in. The way Todd looks now, Principal Ashton may need Officer Martin’s protection. Aw, come on, Dave, I was hoping to see Principal Hobbit getting slammed today, not Todd simply walking down the hall! Is there something wrong with being right handed? Are you one of the left handlers trying to take over the world? Hmm? Talk, you fiend talk! Touchy touchy! Merely an observational comment. What? No pluralses in her written English? My guess is that since she’s writing, she has more time to actively process out the pluralses (which she’s probably been scolded for in the past). Why would she put Ss in her writing? If Elmer Fudd, talking about a “wascawy wabbit”, was to write it, he’d write “rascally rabbit”. He knows what it is supposed to be, he just can’t say it. That’s why it’s called a SPEECH impediment. Apparently the popups aren’t completely gone. Check your email, Dave. Looks like you just broke Dave. Now he might just kill everyone off George rr Martin style, all because of you. It’s Selkie, Darkier and Edgier. Bleep it Dave!! Now I’m seeing Selkie dressed as Rorschach from The Watchmen. 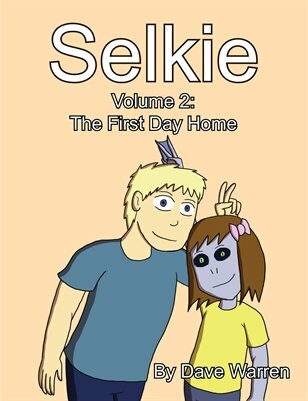 That is one comic that should not cross over to selkie. Selkie wearing the shifting-splotch mask, standing in her trenchcoat and purple pants in the rain, watching the city and it’s filth and vermin crawling below. Dave I love you and Selkie dearly so I must apologize in advance. Imagine if you will a time in the future where you find yourself unable to draw the comic for some unknowable reason and you must hire Rob Leifeld to draw it for you. I leave you with the mental scarring that will follow. Oh good; Selkie will never want for pouches to hold her heat packs and cell phones again. Ooo! Angry dad is angry! So, here we have Todd mirroring what Tom did earlier, pretty ironic. And FYI Todd, the answer to your second question is Mr. Trunchbull, and I wouldn’t be to surprised if he’s the answer to you other two questions as well, demanding Ashton punish Selkie or he’d file charges against the school. Off the record though we don’t know for sure if he treats everyone he thinks crosses him like that or just to people he thinks are trying to persecute his son, or if he thinks bullying is okay as long as you don’t use physical force, though his son’s dialogue definitely suggests he gets his behavior from his father. Anyway I can’t help but notice that everybody’s happy that Ashton is getting in trouble while I’m the only one upset that trunchbull gets away scott free, what’s up with that? Seriously someone explain this to me. Also Dave, is Tom going to get away with his “I was just protecting my son” excuse or will he finally get what’s coming to him. Also on an unrelated note when will we hear more of that “Todd’s ex-girlfriends lost daughter” storyline? Possibly this wednesday? And before I submit I might as well explain my reasoning as to why Trunchbull’s more guilty than Ashton: 1. It’s a well known fact that all children automatically lie to stay out of trouble. 2. He convinced himself that there was an actual conspiricy against his son when faced with multiple witnesses several times. 3. He refused to believe his son could do any wrong until it was staring him right in the face. 4. When Todd gave him an angry phone call he decided he was a “jackass” and told him the Sarnothi as a race couldn’t be trusted. 5. Most importantly he’s been threatening the principal to not punish his son for anything. Now I know some of you will get on my case for going against the trust between son and father (he’ll probably hide behind that in court) but you gotta remember that he’s like 8, children naturally do bad things when they’re sure they can’t get caught (okay some adults do that too, and some kids mature faster out of that behavoir.) and Tom should understand this, he’s a professor for cripes sake. (this could affect his credibility, I wonder if he’ll bring it out on his son if it does) anyway here’s hoping Mr. Trunchbull loses that class action lawsuit, please explain to me how his actions aren’t as bad as the principal’s if at all. Peace. I can’t really talk at length about Trunchbull at this time, but I will saw on the Andi plot line that I am SUPER irritated with myself that I’ve spiraled away from it this long. … Is it bad that I want to see what buff butterflies would look like? Yeah, but the migration takes numerous generations to be completed. Any given butterfly only makes part of the journey. Which, in terms of knowing where to go, is actually more impressive. She’s about as bad at writing essays as I am. I love it!